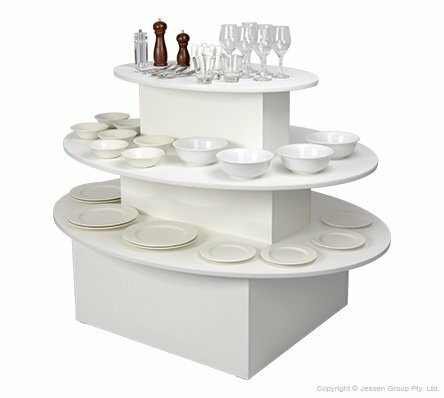 Round Retail Display Tables - 3 Tier White - Ships Same Day! Looking for round retail display tables to promote your merchandise? This merchandising table helps you display different merchandise, including books, clothing, and electronics, with ease for customers to peruse. There are 3 tiers to the display that allow heaps of product to be showcased and give plenty of choice. The top shelf is 920 x 615mm, with the bottom two shelves having 285mm of space between levels to make providing heaps of stock or showcasing taller items easy. These store fixtures, round retail display tables are set 420mm off the ground to be easily accessible to different customers. Overall, the stand is 1050mm tall and has a 1530 x 1400mm footprint. The actual base of the fixture is 800 x 880mm to support the entire table. Weighing in at 32kg, the table remains in place once in a desired position and has nylon glides on the bottom that help to prevent damage to floors whilst in use. This merchandising display is made from laminated timber to provide an affordable yet durable store fixture. The white finish helps to focus customer attention on displayed product whilst working within any décor. Assembly is required using simple tools, as the fixture is shipped knocked down to provide lower shipping costs. Slimline Warehouse has same day despatch available with this and most other in stock products when purchased by 2pm EST to anywhere in Australia!